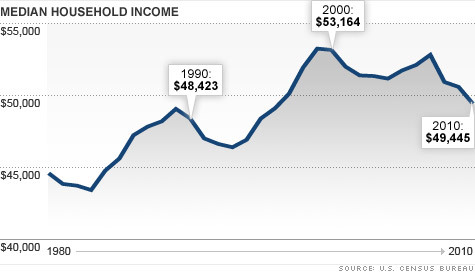 Middle-class income fell 7% in the last decade, adjusted for inflation. So are you better off than your parents? Go home and ask a parent what year it was when he/she was 25 years old. Next, ask what he/she earned during that year. Use the CPI calculator to see how much you would have to earn to have the same buying power as your parent when he/she was 25 years old.